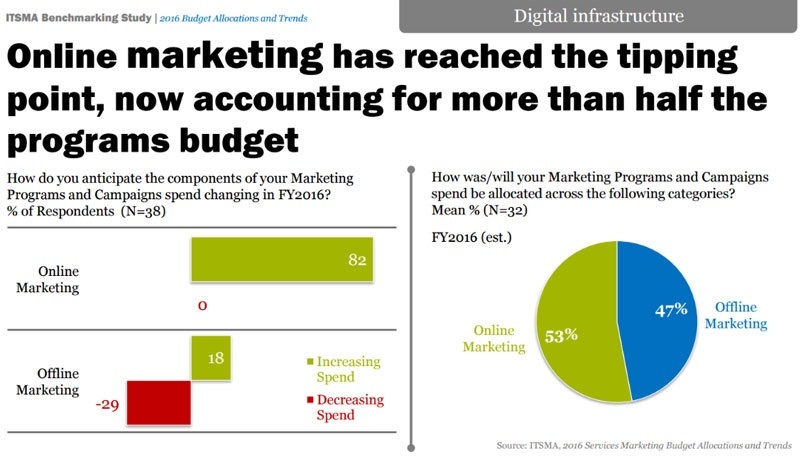 If you are in marketing, you surely know how much it has changed over the past decade. With the increasing popularity of social media, mobile phones, and the general population turning to Google for every question, the entire landscape has changed. In 2006 only 11% of adults were on social media and that has risen to 78% in 2016! Where TV commercials and direct mail ads once reigned supreme, now email newsletters, SEO, blogs, social media profiles, and digital ads rule the roost. 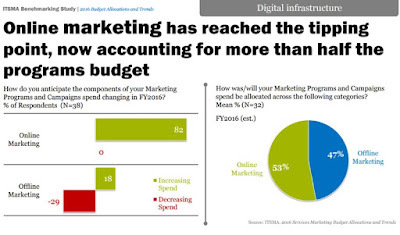 Look at this year where 82% of companies planned on growing their online marketing spending, while only 18% planned to grow offline marketing. ITSMA 2016 claims online marketing has become the “central nervous system of the company” whereas it used to be only a limb. Google has continuously improved their algorithm which has totally changed how online marketing is done. In fact, they change their algorithm 500-600 times per year! Remember when everyone was trying to cram as many keywords onto their pages as possible without concern for the user experience? Thank goodness, times have changed and now quality reigns supreme. Many of the old tactics have been coined “black hat” and new more transparent strategies are in place. We are seeing more and more businesses focus on building their online presence to meet the needs of their current and potential customers. This has come in the form of regular blog posts, active profiles on Facebook, Twitter, Pinterest, Instagram, etc., automated email sequences, free promotional content like ebooks and infographics, and videos of all sorts. All of these different efforts fit together to form an online strategy the moves buyers from merely interested visitors to loyal customers. Now the majority of the population has mobile phones (207.1 million in the U.S. as of 2016) and internet speeds are only getting faster. We all want our information as efficiently as possible and video is the medium which is making that happen. Video is and always has been an engaging medium. It is arguably the closest we can get to real life interactions via digital communications, with the exception of developing virtual reality and hologram technologies. However, as far as mainstream tech that is most likely to dominate in the near future, video is it. 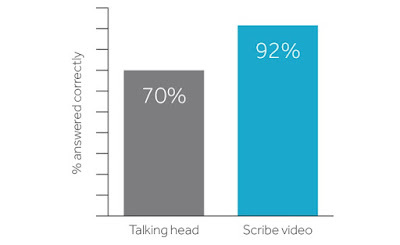 Cisco has predicted that by 2019, 80% of all online content will be video! We all better get on the video train and get comfortable with it. Many people are intimidated by the idea of creating videos because they require equipment, videographer skills, backdrops, sound equipment, editing programs, digital tools, etc. How can someone who is not trained in making videos do so with a professional result? Video is often created as a full production promotion. This would require professional video and sound equipment along with a script, possibly actors, a set, and all that goes along with it. While these can be quite exhaustive when it comes to all the details, they can pay off big for your brand. 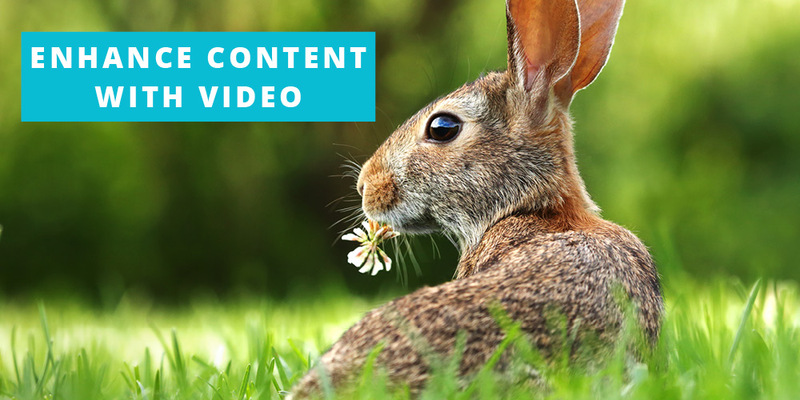 By sharing your final video on YouTube, your website, and other mediums, you can increase brand awareness and drive traffic to your sales page. The upside, video allows you to engage and entertain your audience in a way that consumers prefer. The downside, you may need to invest in a camera crew, actors, sets, clothing, a writer, and more. 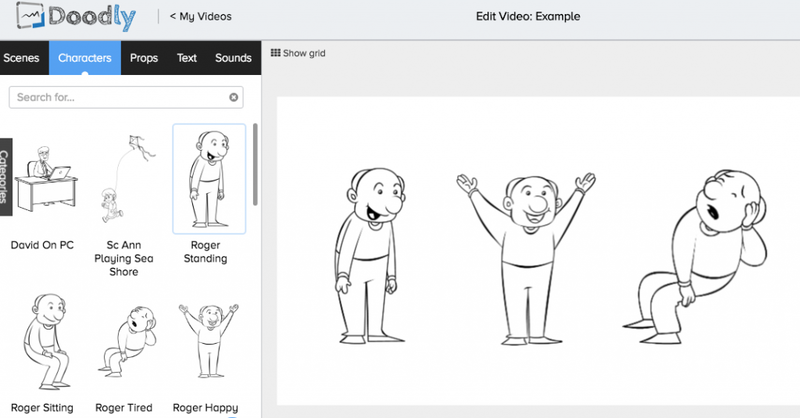 The most up-and-coming promo videos in recent times are whiteboard explainer videos. These are the animated shorts where a hand is drawing out pictures, scenes, and words to help describe a concept. These have become insanely helpful with increasing conversion rates on sales pages and helping to move potential customers through the buying funnel. Research has found they are memorable, help audiences learn, and are rewarding to watch. The upside, they don’t require any recording equipment or real life sets and are incredibly effective. The downside, they can be a bit expensive to purchase from companies who make them for you. Don’t get too overwhelmed, there is also another approach. The DIY approach also can work well for certain types of videos. You could even take a video with your smartphone! Now you wouldn’t want to make a commercial this way but you can engage your audience with content they will be interested in that relates to your business. For example, you could give a behind-the-scenes tour of your business, give a how-to tutorial, interview someone within your company, explain an upcoming contest, make an announcement, etc. With new live streaming becoming increasingly popular, audiences appreciate seeing the face behind the business and authenticity counts where production quality lacks. Oftentimes a landing page for a product or service can be greatly improved with a whiteboard video. If you want to create one at an affordable price you could even use a user-friendly DIY tool like Doodly. The interface offers drag-and-drop functionality and a whole collection of characters, scenes, and props. Best of all, you can make as many whiteboard explainer videos as you want without the hassle of hiring an expensive contractor or company. You can check out more about Doodly to get started with video today! With this software, you won’t need to hire anyone else or spend an absurd amount of money to get started. Gotta love those tools that make digital marketing easier, right? By incorporating video into your strategy now, you will not only be ready for the changing trends in online marketing, you can start reaping the benefits of increased exposure, traffic, and conversions now. Don’t get left in the dust with keyword spamming and, dare I say, flash. What do you find the biggest challenge to be with video marketing? Has your strategy evolved to incorporate the changing trends like whiteboard explainers?